February 7th, 2016 will always be a memorable day for me till I die. On that fateful day, I had set out from house to attend a live worship session being organized by Funmi Oloyede the visioneer of Passion & Praise music group. I didn't know I had a date with destiny. The drama started when I got a witness in my spirit to leave my balance with a student whom I was paired by the conductor of the bus I boarded. As if that was not enough, the incident repeated itself at Ojota when I alighted from another bus and I ended up trekking to Ogba. I didn't know what came over me, but I found myself going on the trip with some much joy and revelations from heaven on my way. As I got to Acme road in Ikeja, I met this boy wandering away during school hours in his school uniform. Unusually I became attracted to him and we got talking. I asked him what he was doing when he was supposed to be in school. He said he was sent out of school because his mother could not give him the necessary item he needed for his schooling. I felt for him and since I couldn't afford any money to help him. I prayed with him an d took him to where I was going and he followed me as if we had known each other from ages. He answered all the questions I asked him intelligently and I was getting insights about the boy's future which the mum confirmed to me at our subsequent meetings. God is indeed a master planner. When we got to my destination, he was asked his name and he said Sylvester and I was meant to understand that Sylvester actually meant a wanderer. Apparently, the boy has been wandering going by what the mum told me later on. That day we changed his name to David. I have been a part of the family since then and some things have been made known to me about him and his family which I won't begin to mention here. I have adopted him as a son and I am now providing leadership and mentoring to him and his siblings. God told me he is an assignment for me. I have a ten-year project on his life to bring him up a responsible young man that everyone will be proud of. He turned 11 years old today and I took him to celebrate with him. Please join me and wish my son David Onoja happy eleventh birthday. He is so dear to my heart and I love him so much. He brings me so much joy. I bought a book for him "The battle for the Young" by Gbile Akanni and he blew my mind with how he captured the summary of the book in one page. I was so proud that I gave him a hi-five and hugged him. My dream for him is that he will resume in Kings College Lagos next academic session. He is in primary six. Say a word of prayer for him. 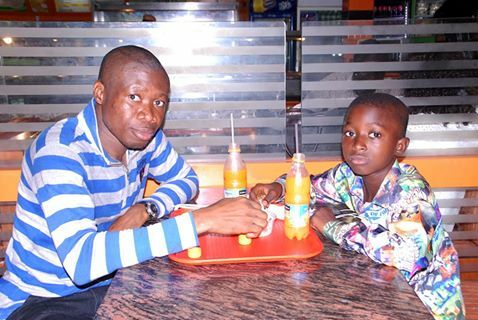 Ladies and gentlemen, behold David and I over a meal of Salad and some orange juice at Sweet Sensation Ogba. Note: Imagine if more men consciously raised boys to become whole men? Imagine that Nigeria that Women and Children can feel safe with men? Click here to Join our Group on Facebook where Men find results and mentor others for a better world. * Chima is my University mate.